If you have any questions or suggestions you are welcome to join our forum discussion about Ichimoku Kinko Hyo. This technical analysis method was developed in the late 1930s by Goichi Hosoda, a Japanese journalist, known as Ichimoku Sanjin (“what a man in the mountain sees” in translation). The word Ichimoku can be translated to “a glance”, Kinko can be translated to “equilibrium” and Hyo means “chart” in Japanese. Or if we are to translate Ichimoku Kinko Hyo, we will get ”a glance at an equilibrium chart”. Such a chart is purposed to identify the probable direction of prices and to help a trader pick the most appropriate entry and exit points. Senkou Span A and Senkou Span B form an area, known as the Kumo, or the Cloud. It is used in order to identify the major trend. There is a bull trend when the price is above the Cloud, a bear trend when the price is below the Cloud and a trading range when the price is in the Cloud. A bull trend shows signs of strength when Leading Span A (green cloud line) is climbing and above the Leading Span B (red cloud line). In this case a green Cloud is generated. A bear trend shows signs of strength when Leading Span A (green cloud line) is declining and below the Leading Span B (red cloud line). In this case a red Cloud is generated. As the Cloud is projected 26 periods in the future, it enables a trader to take a glance at future support or resistance. First, a signal to buy is produced when the Conversion Line crosses the Base Line from below to the upside. A signal to sell is produced when the Conversion Line crosses the Base Line from above to the downside. Second, in case a bullish crossover signal is produced above the Cloud, it is considered as a very strong signal to buy. 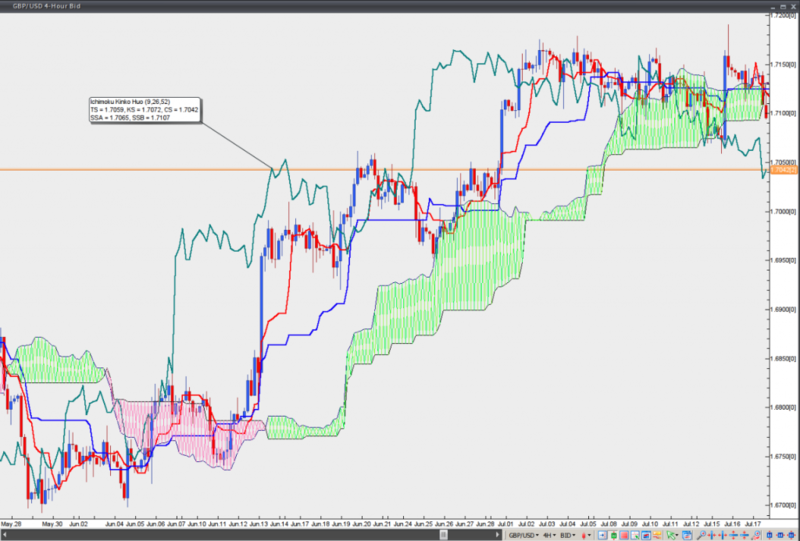 In case a bearish crossover signal is produced below the Cloud, it is considered as a very strong signal to sell. Third, in case a bullish or bearish crossover signal is produced within the Cloud, it is considered as a signal to buy or sell of medium strength. Fourth, in case a bullish crossover signal is produced below the Cloud, it is considered as a weak signal to buy. In case a bearish crossover signal is produced above the Cloud, it is considered as a weak signal to sell. Fifth, the Lagging Span can be used in order to determine the strength of the signal (buy or sell) as well. In case the Lagging Span is below the closing price over the past 26 periods and a sell signal is generated, this means that bears are strong. If not, then the signal to sell is weak. In case the Lagging Span is above the closing price over the past 26 periods and a buy signal is generated, this means that bulls are strong. If not, then the signal to buy is weak.